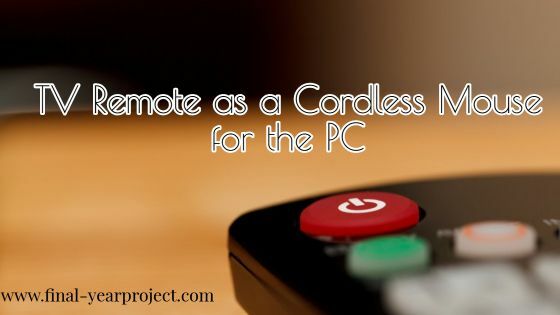 "TV remote as a cordless mouse for the PC" is an Electronics final year project and contains all about how to make a system to control your Personal computer remotely with almost any remote controller you can find in your house TV Sets. 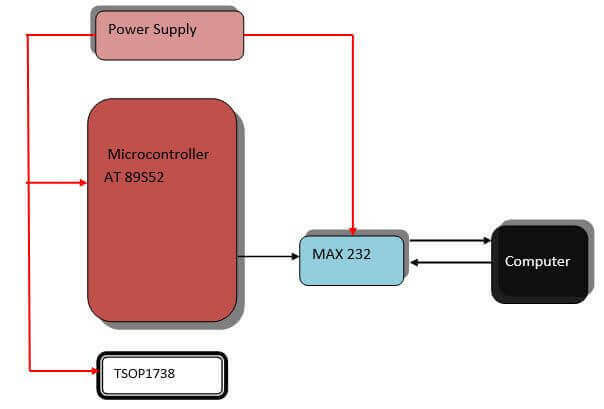 For the purpose of designing a PC remote control, we should be aware of the basic fundamentals of the working of simple IR remote control. So, let's see how this project works and what is the aim of this electronics projects. You can also subscribe to FINAL YEAR PROJECT'S by Email for more such projects and seminar. The aim of this project is to control PC remotely through IR remote. This IR remote acts as a mouse, the cursor position is moved according to the keys pressed on the remote. This introductory part explains about the "PC controlling using IR remote" motivation to build this project. The remote control is mostly infrared which plays a revolutionary vital role in changing our lives. A remote control works on the principle of IR technology. Here we prescribed the TV remote control which is the mother of PC remote control. An IR remote control (the transmitter) sends out pulses of infrared light that represent specific binary codes. The IR receiver in the TV, stereo or other device decodes the pulses of light into the binary data (ones and zeroes) that the device's microcontroller can understand. The microcontroller then carries out the corresponding command. The convenience of selecting TV channels using your remote and then pointing the same remote to your Computer so that you can control the whole system using the single remote control. In this project, the IR remote acts as a mouse. The cursor position is moved according to the keys pressed on the remote. As a PC mouse is wired to the system, one has to sit near the PC to operate it. This becomes very tedious when the PC is used for presentation purposes (when using a projector). In this proposed system TV remote can be used as a cordless mouse, and the user need not operate the PC sitting near it. A typical TV remote sends coded infrared data that is read by an IR sensor interfaced to an 8051 family microcontroller. This data so received by the microcontroller sends it to the COM port of a PC through a level shifter IC. This IR code is traditionally RC5 code as followed by some manufacturers. Software named "PC Remote" is used on the PC that recognizes data received from the microcontroller through the COM port and performs the required operation. Designated numbers on the TV remote are used to perform up - down, right - left cursor movement. Features like left click and right click of the mouse can also be performed with of the TV remote. Further this project can be enhanced using Bluetooth/ RF technology to overcome the traditional line of sight communication drawbacks of the infrared type. This project works only on a operating system having hyper terminal and a computer must have an RS232 serial port. Please download the project from below link and see block diagram, circuit diagram, working and all the required details for this project. If you like the project, share it with your friends and do give your thanks to the author for this useful project.